As a vehicle primed for some rough and rugged driving and weather conditions, the Jeep Cherokee is complete a range of standard and optional safety features. 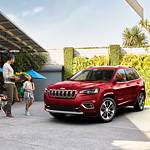 If you go with the Limited, Overland, or Trailhawk trim, you can boost the compact crossover SUV with the Technology Group, which includes full-speed forward collision warning with active braking. The full-speed forward collision warning system uses radar sensors to detect if the Jeep Cherokee is getting closer to another vehicle with tremendous speed. Since that could possibly result into a frontal crash, the system then deploys an audible chime, which is accompanied by a visual warning in the driver information digital cluster display. Of course, there is the possibly of not processing the audible and visual warnings in time to avoid the crash. So, the full-speed forward collision warning system is accompanied by active braking ability. This feature enables the brakes to automatically activate, thus bringing the Jeep Cherokee to a full stop.